For the "Custom Art" field in the Team Editor, I have a couple of questions. 1.) Where do we put files to be used as custom art? I know in older madden games like 08 there was a CustomArt folder, so I didn't know if we could just create one in the Madden19 folder and that work or if there was some other way of doing it. 2.) The Custom Art field is just a text box with no way of importing a file, so how do we choose the custom art we want to use? Just copy/paste the file like Documents>Madden19>CustomArt>FileName? Madden 08 roster. This happen with a few players, how can I solve it? Looks like Madden 19 doesn't have that field in the team table any longer, so you cannot edit it. So a problem i have with creating a player is that everytime i create one i have to restart AMP to create another one or it'll glitch out and i wont be able to make the player. g8rgrad2k wrote: So a problem i have with creating a player is that everytime i create one i have to restart AMP to create another one or it'll glitch out and i wont be able to make the player. When reporting a bug/issue please read the first post and include the info that I asked for. Since you're new I'm going to assume you are asking about Madden 19. Creating a new player from the player editor is based on the limited knowledge that we have of the fields from the player records. We do not know what all of them are for 04-08, and much less for 19. There may be fields that need to be set to specific values that are not currently set up to be edited inside of the player editor. If you need to add a bunch of new players it is easier to use csv importing since then you can see all the fields and can base any unknown fields on what the other records are setting them as. 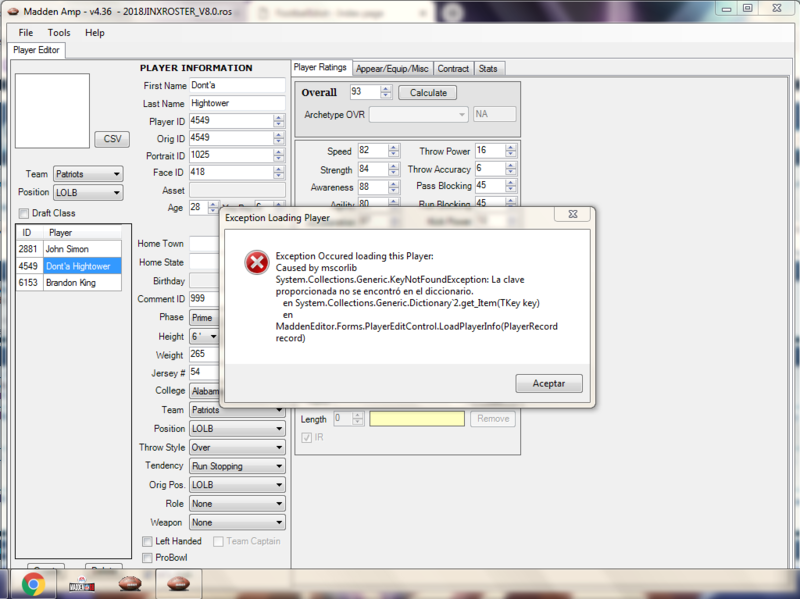 That being said I will look into why it is glitching when trying to create more than one player. I noticed Last Name field is limited too low in Player Editor it seems it's 13 characters and in a game there is example Rodgers-Cromartie what is 17 characters long. Sting Ray I don't see the field to edit the Coaches first or last name. navygoat1998 wrote: Sting Ray I don't see the field to edit the Coaches first or last name. I knew I was forgetting something, it is in the coach editor but not being displayed when the coach is loaded. Will fix. With the newest update, they got rid of the high top player exclusive Jordan’s and replaced them with low tops....is there anyway that you would be able to give us the option to equip the high tops in the next AMP update?